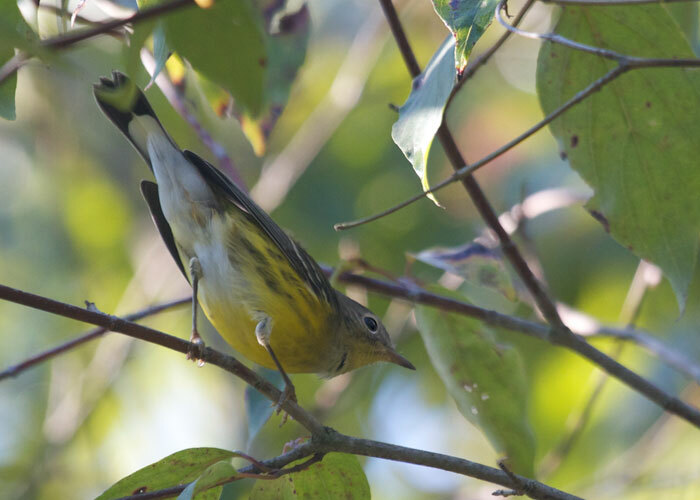 Wood warblers like this magnolia warbler are migrating through the Midwest, going south for the winter. Only now there are lots more of them than in spring, because their numbers have ballooned with the young hatched this year. It's a great time to get out in the morning and check out the tops of the trees where the early sun lights them up. Lots and lots of warblers to see right now. Don't miss them! I love the black band across the underside of the end of this warbler's otherwise white tail. Kind of a badge of the magnolia warbler! When we compared it to another, more expensive scope, we found the Razor the better one!